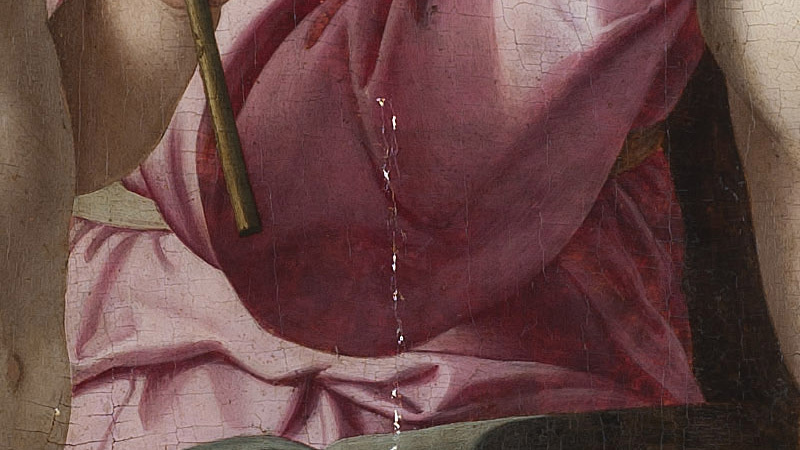 Listen to Conservator Nica Gutman Rieppi’s descriptions of technical imaging details, what the imaging reveals, and how she used the technical images to inform her conservation of the surface of a Follower of Bronzino’s Madonna and Child with the Infant Saint John. Drag the sliders back and forth to see the effect on the work’s surface. When viewed under UV light, dark patches appeared across the painting’s surface. 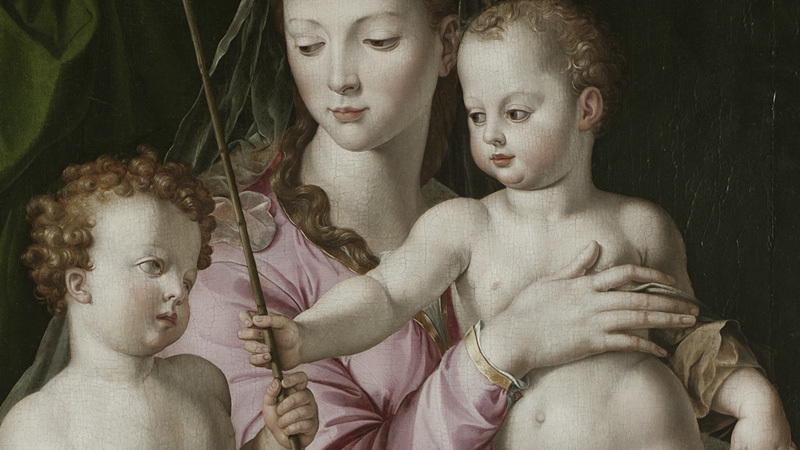 The image on the left is the painting before treatment, it’s a detail of the Madonna and Two Children. And the detail on the right is the same area examined under ultraviolet illumination. So different materials on a painting, they all respond differently to ultraviolet illumination. We see some areas are light and some areas look dark. What we’re seeing, we see these sort of dark patchy brush strokes all across the face of the infant St. John: his neck, torso, as well as the torso of Christ child and the hand of the Madonna. What we are looking at is retouching. And the retouching is not fluorescing in the same way that the paint has. It’s much more recent and it doesn’t have the same aging properties as the paint. What we noticed here that was most disturbing is the fact that this retouching is applied in broad brushstrokes. And the question becomes: what’s hiding underneath that retouching? Is it covering areas of loss? Is it covering areas of original paint that are damaged? Or is it just covering original paint? With infrared light, the underpainting that is usually hidden under the paint’s surface becomes visible. The image on the left is a detail of the Madonna’s torso, we’re looking at her pink robe and on the right what we are looking at is the same detail examined with infrared light. So certain artists’ materials they respond differently under infrared light. So some materials that reflect the light appear very light in the image and materials that absorb the light appear dark. And we end up with a black and white image of the painting. 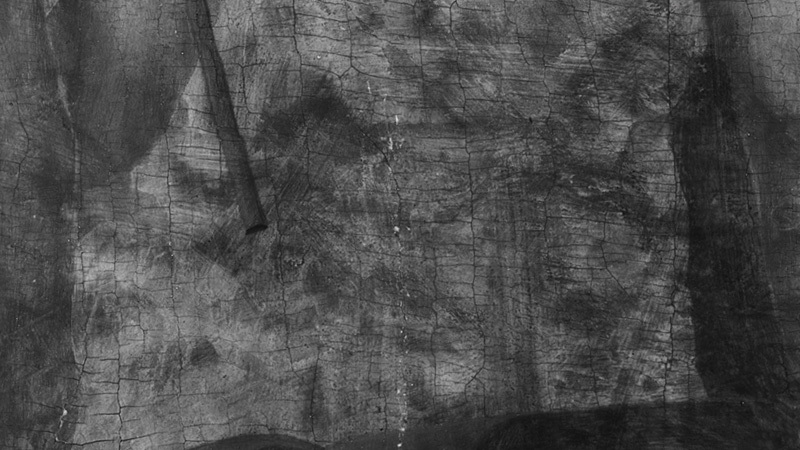 Sometimes it allows us to look through paint layers: for example we have a white ground that is highly reflective and sometimes artists’ underdrawings are rendered in materials such as carbon that tend to absorb the light and they appear dark in an infrared image. In this case we did not find an underdrawing, which was surprising and unexpected. We know that it is a copy of another work, we expected to see some sort of method of transfer of image and what we are seeing here, we see these sort of splotchy, dark, muddled appearance. It was not applied as any form of drawing, it doesn’t follow figures or forms, but it must have served some tonal purpose to the painting. Under extreme magnification, the painting’s surface becomes a landscape of tiny cracks and crevices. The detail on the left is a detail of the Christ child’s foot and what we are looking at on the right is a detail of the Christ child’s heel photographed under a microscope, it’s called a photomicrograph. I’ve been looking at the painting from the stereomicroscope from the beginning and it tells us a lot, we can look at the cracking structure, the condition of the paint, we are able to look at the pigments that we see on the surface, get a sense of surface texture. What was really interesting here is after we had examined the painting with infrared and we didn’t detect an underdrawing I had looked at the painting with a stereomicroscope and I didn’t see anything. And then after we did the reforming treatment it was amazing the amount the amount of information that appeared. I thought maybe we might see some incision work, some marking in the paint so I was very surprised at this point to come across certain areas we could see that an underdrawing was rendered and sketched in paint. 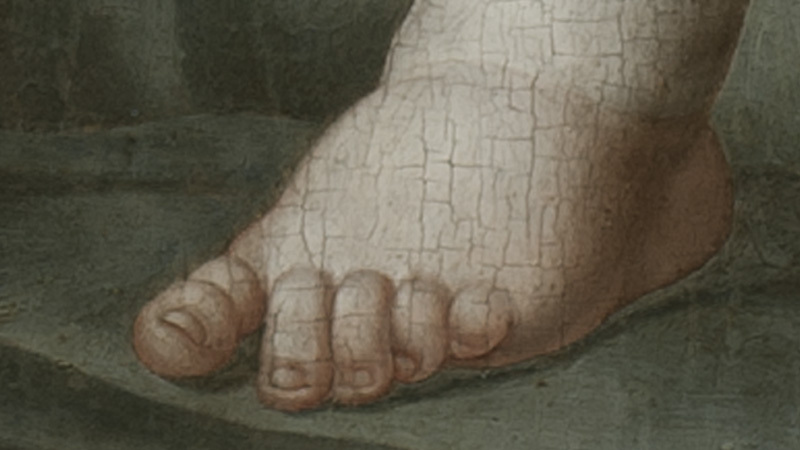 We could only see them in some areas and in particular here along the edge of the Christ child’s heel, but what they suggest was that loose quickly sketched drawing existed just to establish the contours of the figure. X-rays can reveal pentimenti, ghostly shadows of revisions and changes to the painting’s composition. 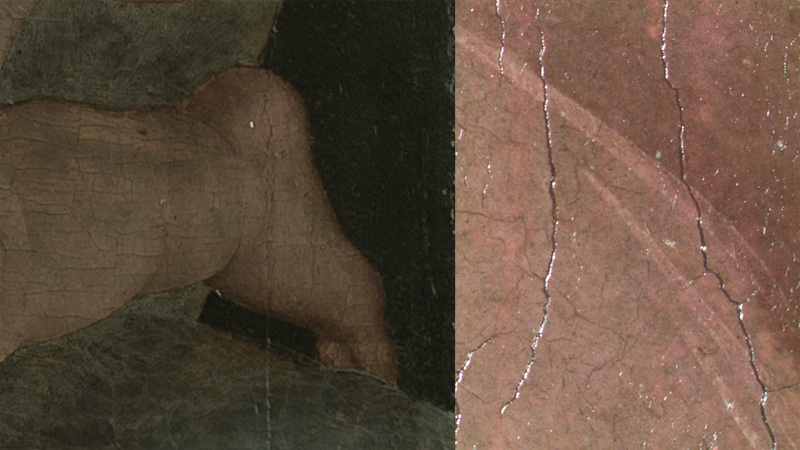 The image of the left is a visible like detail of the Christ child’s foot and the image on your right is a detail from the x-ray taken of the same area of the painting. An x-ray is very useful for telling us a lot about the structure of the paintings, sometimes we can see underpainting, we can see areas of reworking and how the image evolved onto the painting support. 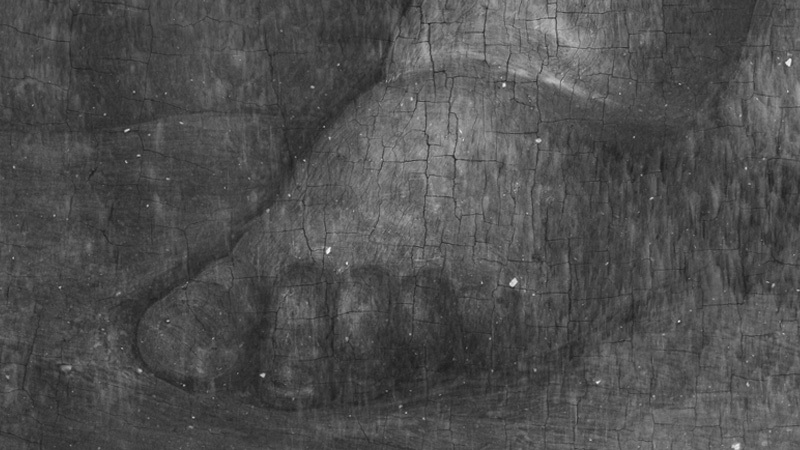 So in this case we can see sort of, it looks like a dark line, outlining the contours of the leg and the toe and we see it in particular on the big toe of the Christ child. And what we’re seeing there, the reason that we see this line is because there is less paint in this area and it’s rendered dark. And what we’re seeing is that the paint of the background was carefully brought up to and around either reserves that were left for figures yet to be painted, or the other way around the paint was brought up to and around and leaving this light colored underdrawing visible serving as a guide, a guide for the painting. And we don’t see any spontaneous action or changes made during this process so in thinking about this painting possibly being a copy after the Bronzino painting, the image is very direct and this painting was painted very directly. A pinprick size piece of the painting can show the layers of canvas, primer, pigment and varnish. The detail on the left is taken from the Madonna’s blue robe in the lower right quadrant of the painting. 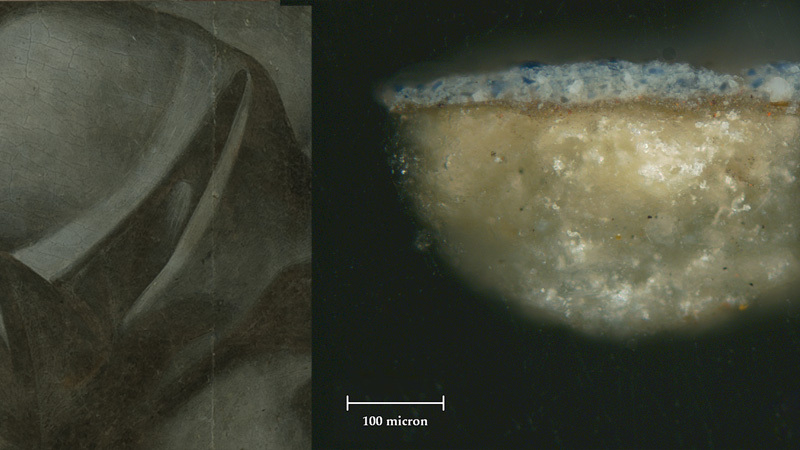 On the right is a tiny microscopic sample that was taken from the painting and prepared as a cross section. We take very tiny samples about the size of a pinhead. So it’s really another interesting feature about this painting is the blue drapery. 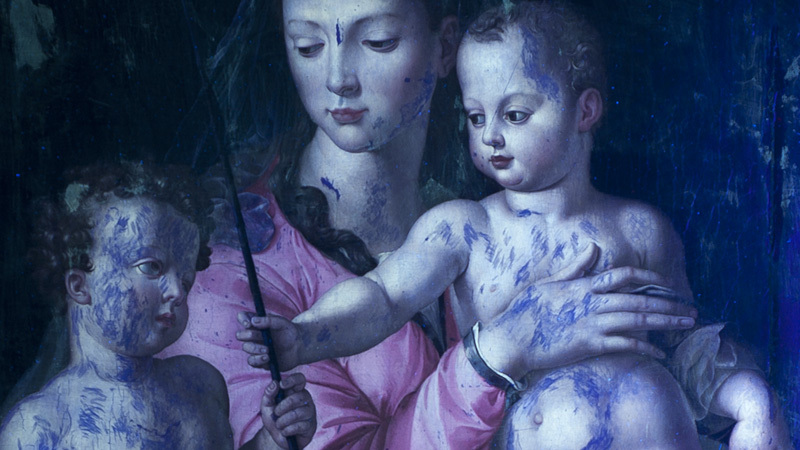 When we look at the original Bronzino painting, it’s painted in a brilliant bright blue and then when you look at this painting it’s a soft muted blue and the question became is this something that is part of the artist technique, an artist choice, or are we looking at something that’s an alteration of the paint surface. What we see in this bottom layer here, this large off-white layer that’s the actual Gesso layer. And then on top of that layer we see a sort of darker layer and that layer represents the brown underlayer and then on top of that what we are looking at is the blue paint of the robe. Analysis of the blue showed us that the blue pigment, in fact, is smalt. Smalt is a pigment that’s made of glass and it’s known to have an unfortunate feature that it discolors over time.